Why Do We Follow Systems Even When It Doesn't Make Sense? Why Do We Follow Systems Even When It Doesn’t Make Sense? Why do we always follow systems even when it doesn’t make sense? I’m not just talking about business—I’m talking about life. We don’t even realize we are trained, like dogs. To respond, to act. To exist. As I write this, I just went through airport security. I had spent the night at the airport, and my nerves were fried. But after having gone through security earlier in the day, I was asked to go through again. Now, I was in no mood to go through security again. I wanted coffee. But I’d have to wait to get it until after security, because since 9-11 no more gels, aerosols, liquids etc. And any coffee I would have wanted won’t go into a plastic bag without spilling. The system says: I can’t track Libby individually (until we are ‘voluntarily’ chipped, ugh), so it’s the same policy as though I just arrived here and in case I’m a terrorist. It reminded me of the movie Idiocracy where the individual person has been dumbed down, losing the ability to think for himself/herself, and letting the work of machines take over. Why is that even a possibility? Why do we ever trust machines over intellect? Why do we not question the processes put in place? Should I really have been pegged for a terrorist when I slept at that same airport all night? Of course, I could have been waiting all morning just to get combustible coffee that I could sneak through and blow up the plane. Darn it! The random computer scan busted that airtight plan. Flying through Wisconsin. I bought butter and cheese. I had to, because it’s Wisconsin. But my cheese was confiscated because it might have been very dangerous cheese! That could have been true. Or it was just all part of the system someone put in place for situations NOT like mine. Once a system is put in place, we blindly follow. Then we place rules on top with a punishment attached. An example: Don’t cross the road (even if there’s no traffic for miles!) until the little red guy turns to white on the traffic light. If you do, you’ll get fined. We are purposely giving up our ability to think rationally. I am not arguing systems aren’t good. They can be eerily effective. I just think it’s good to be aware that as we use more and more technology (as I write this from my smartphone-turned-dumbphone) we should be using our brains more, not less. Don’t give in to systems. Make the systems work for you. What systems do you see in place in your daily life? LiveWorkAnywhere brings you resources and advice for traveling entrepreneurs, digital nomads, freelancers, and remote workers. LiveWorkAnywhere was inspired by the dream of freedom to live and work wherever you choose. Get an International SIM card with great rates. 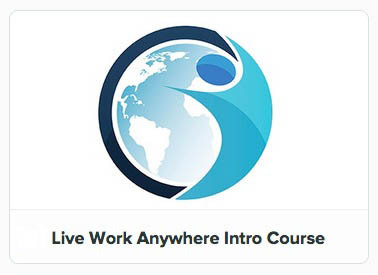 LiveWorkAnywhere is a site I wish I had starting out. LWA connects you with stories, tools, and resources that help you build an Anywhere Startup, allowing you to live and work from anywhere with an Internet connection. An Anywhere Startup is, simply put - a startup that can be run from .... anywhere. Take your business on the road or create a business to support your travel lifestyle. Take the LWA Intro Course or jump into the Anywhere Startup.